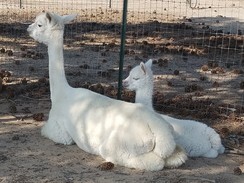 Openherd: Alpacas de La Mancha - Get great deals on alpacas in Openherd auction lots! "...criating coats of many colors..."
I don't think we could be more proud of Giacomo than we are right now! He placed 4th in the GWAS 2014 Fleece Show at 8 yrs old, competing in the adult class with a number of Light Fawn boys and girls 3 & 4 years his junior. 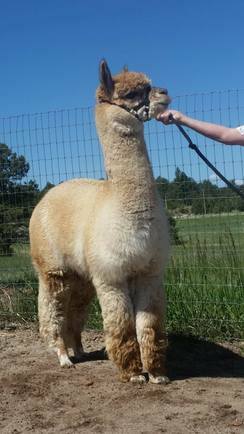 Fleece judge Cheryl Gehley said that his fineness & handle were "incredible" for his age. Not only that but his yarn (without blending any other fiber) is a favorite with everyone, including the mill that spun it! Unfortunately we lost "Dovie", the matriarch of our herd, along with the cria she was carrying, in May 2013. Cause of death was acidosis, due to accidental pellet overload. It was a very sad day for all of us. Giacomo's Bianca was her last born. Dovie was our very 1st purchase. 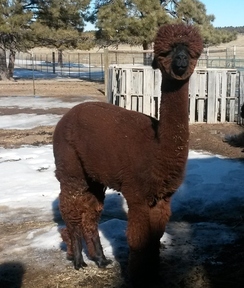 We purchased her in 2007 from our mentors, Tom & Diane Cribley (Falkor Ranch Alpacas), who recommended her for a first female. 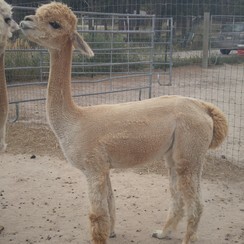 It was a wise purchase as Dovie soon delivered our 1st cria and became our teacher. She was an experienced mom then and continued to breed easily and deliver without assistance. She was very protective of her babies and always had plenty of milk. She was a very large girl so we didn't need to concern ourselves with the size of the male we chose to breed her to. 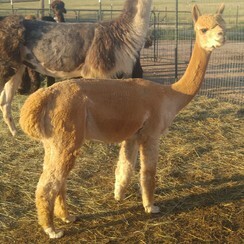 She gave us 5 terrific offspring (2 white males & 3 females-- a W, a LF & a DF). She always added her superior fineness to the strengths of the service sire. At 9 years of age, her fiber was still a grade 2. Dovie is the grandmother of our 4x Color Champion and one of her sons (who is also very fine) sired a beautiful light fawn female in 2013.